The lighting and shadows are so impressive in the late afternoon/early evening. This was on one of the walkways. Having a lot of "nerd fun" at our leadership team meetings. Love this group -- so grateful for a work team that is a joy. Fabulous lines and patterns! FAV. I love the bold graphic statement this makes. Terrfic shadows, light & shapes. Beautiful. Just love the pov and shadows. Wonderful B&W image! Love all the shapes and shadows! Fav! So pleased you are enjoying yourself! It makes such a difference when you have a great team! Simple and lovely - well seen. It does make a huge difference when the team is great. This is a wonderful image, almost looks like a drawing. Light and shadow are always used in an artful way by you, Taffy! This is an example of artistry. Fav! 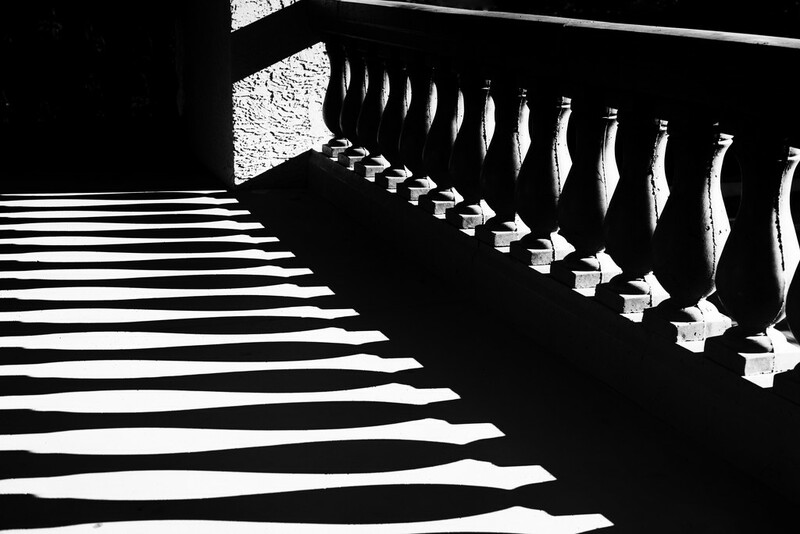 Great patterns and lines and shadows. Fav and follow! Awesome! Love shadow shots this is fabulous! Such strong shadows. Wonderful shot. Fantastic capture. Great light and shadow. Absolutely fantastic shot. Love it. Got to be a fav. Okay, saw in my feed and thought @northy and wondered what the story was that she was trying to do. But I guess I should have known it was yours because it is architecture. Either way I think it is cool. WOW - so in love with this shot! Big FAV. Fantastic shadow patterns! So bold and precious. Intriguing too. This is just such an amazing shot when viewed on black. Brilliant image. Fav. This is the kind of stuff that 365 taught me to "see". This shot is excellent! Amazing capture. Love the shadows. Love this. Love light & shadows but never see to come across any that are as interesting. Great mono, super repetition, composition. fav. @sailingmusic Aw...thanks so much, Myrna, for such an enthusiastic response. I was pretty excited when I downloaded it. The lighting here is so harsh, but makes for such interesting shadows. What an incredibly striking shot. Love it. Fav. Love this! It looks like something from Alice in Wonderland. Love the superb high contrast here!! Fantastic abstract, good eye to see the shot Taffy. Love the drama of this shot. Really nice image. Wow love the lines, and contrasting black and white. I thought it was @northy shot at first! @radiogirl I take that as a high compliment! Impressive & eye catching image- fav! Sorry so late to the party on this one - as you see, I've been away for a while. This one really speaks to me. I love the extremes of the contrast you created here, besides my love for the rhythm of the patterns. Bold and striking shot, especially love those crisp shadows. Happy to see this made #2 for the week - congrats! Still rock'in the Top 20 I see. Cool shot! Congrats on 2nd place on TT! Well deserved, great shot! @michaelelliott Hi Michael! Thanks! Hope you are enjoying your summer! Just saw this on the TT, awesome shadows! @soboy5 Thanks for letting me know -- that's how I found out! @jgpittenger Thanks Jane! Exciting to see a b&w shot like this one in the TT. I never anticipate something like this might be well liked so it was a treat. Congrats Taffy on #2 TT! Love this! @eyesmile Thanks Gena! You must be catching up. I noticed there wasn't a TT yet for this week...at least last time I looked. Fab shot. Stark contrast makes this image. Wel done.